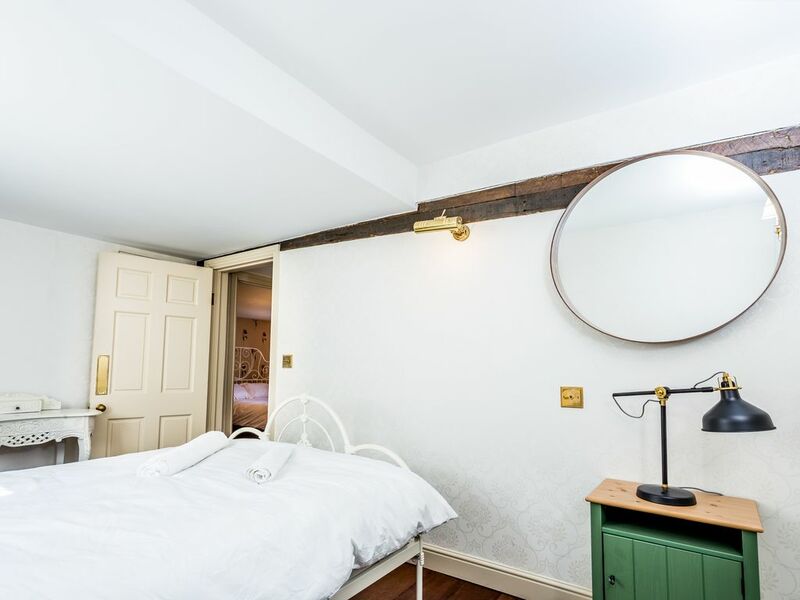 This lovely cottage with country charm right in the centre of historic Cambridge has a lot to offer you and your guests. The home has recently been redecorated and features a homely and modern styling throughout the lovely positioned cottage. You’re greeted with homely charm and the homes living room is located on the ground floor, just next to the entrance hall. There is a large TV, a big sofa and some armchairs, for when you want to relax after a long day of exploring beautiful Cambridge. Watching movies, reading books or playing games, you’ll be spoilt for choice. The sofa can be converted into a sofa bed comfortably sleeps up to two guests. The dining room with a large table is located right next to the kitchen and close to the living room which is great for communal cooking and gathering with your friends or family. Due to the old hardwood floors and traditional cooking station, the kitchen is one of the cosiest rooms in the whole home. The kitchen is fully equipped and ready for you to use it. All 3 bedrooms have comfortable double mattresses and there are 4 bathrooms throughout, with 3 en suite for guests added convenience and privacy. The home has a lot of natural light through the big Georgian windows and offers views of the surrounding neighbourhood. You’ll find modern and comfortable furniture in the whole home and high-spec bathrooms. One of the bathrooms offers a large standing bathtub with views of the sky due to the rooftop windows. Taking a bath here is something to remember. The home is also provided with high-speed WiFi and offers lots of space should you want to get some work done. There is a small space allocated to the cottage to park your car but it can fit only small-medium cars. You’ll have access to the house at all time. Because the home comes with smart locks, you’ll be able to check in any time after 3pm, but please be mindful of noise after 9pm. The home is located in a lovely neighbourhood in Cambridge, close to many picture-perfect Cambridge University Colleges and is walking distance from many of the town's attractions such as the Bridge of Sighs, Kings College Chapel, the Fitzwilliam Museum and countless other attractions. The area around the home has a lot of cute local shops, culture and many great restaurants and coffee shops are close by. The neighbourhood itself is quiet and safe and has a lot of green spaces and small parks. Given the location of the home, most of the town is within walking distance. Trains as well as bus routes closely connect Cambridge to most other cities in the UK. There are affordable Taxis and Uber as well as public transport available should you not want to walk. This home is located right in the middle of the city, so it’s perfect if you want to enjoy the lively city centre. The home is spread across multiple levels and guests who have difficulties with stairs may find it hard to access the whole home. This home is right in the centre of the city and while it’s safely away from traffic, you can hear the hustle and bustle of the city. Travel cots can be provided upon request but guests will have to bring their own linens. I booked the house and 48h after I was advise via email that the house was not available due a double booking, however full payment was taken from my account the next day.